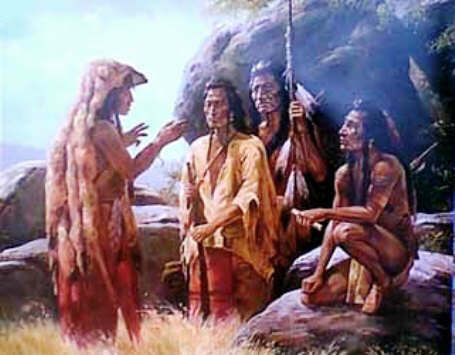 While the battle of Tippecanoe was being fought Tecumseh was upon his way home from a visit to the Creeks and Cherokees of Alabama and Georgia. His mother had been a Southern Indian. The Creeks and Cherokees formerly mingled with the Shawnees, their cousins. But this had not been a mere friendship visit. He desired the Southern Indians to join the red league against the Americans. No advice could have been wiser. It was a sound military maxim. Major Beasley set to work, urged on by alarms of an attack. The attack did not come�he lost patience with the timid folks, black and white and red, who brought the rumors and frightened his people. Soon he commenced to let the work drift. The summer was very hot, the fever of the swamps made the men ill, the Volunteers begged off from drill, the block-houses were not pushed and discipline lapsed. In the morning he submitted. What else could he do? And it made no difference, as happened, for at that very moment one thousand Creek warriors, black and yellow and olive, in their cloth head-dresses and their bright cotton shirts and leggins, armed with guns and knives, hatchets and clubs, were ambushed under Red Eagle in the cane brakes and swamp grasses and the pine timber, within musket shot of the walls. Major Beasley chanced to be looking through the gateway from the porch of his headquarters house. He saw them actually as soon as the sentries saw them. He shouted�"Indians! The Indians, men! "�and ran for the gates. They could not be closed; the sand blocked them and he and his helpers worked vainly. Strain, strain�haul, tub no use! Yelling triumphantly, the Creeks had arrived. In a moment they had shot Major Beasley through the body, had cut him down, hurled him and his support aside, and were pouring into the new stockade. "Fight hard, men!" were Major Beasley's last words, from under the trampling moccasins. "Take care of the ammunition�rally in the houses." The gate in the west end of the stockade was being battered. Axes had blunderingly been left outside; the Creeks were wielding these. A squad of the Indians had climbed upon the half finished bastion or blockhouse at the corner near that gate, and were shooting down into the stockade. They were driven back. Burning arrows had set a house inside ablaze�the kitchen of the Mims house in the center of the stockade was smoking, and the house itself was in danger. But in spite of the bullets streaming through the loop holes and the gates and over the walls, the Fort Mims people did not falter. Hurrah! The enemy had done his worst�he was slackening�he had had enough and had gone to plundering the cabins outside. What a sudden joy swept the despairing garrison! Then the joy faded. Upon his horse Red Eagle had dashed hither-thither among his warriors, turning them back. On they came. Again they entered the open east gates; they succeeded in hacking through the west gate; they scrambled over the south wall. The soldiers and settlers were very tired, and were few in number, now. The old men and women and the children had been stowed in the Mims house, which was large and two-story. It caught fire, at last�the Creek warriors surrounded it and let it burn. The slave at the whipping post had long ago been killed. The fighting had continued for three hours.